-1,494 cc four-stroke, Rotax(r) with three cylinders in-line and four valves per cylinder: The Rotax(r) 1503 N.A. is the most powerfull naturally aspirated Rotax(r) engine and provides instant acceleration for instant fun. For even more power, the Rotax(r) 1500 HO ACETM offers the perfect combination of high performance and fuel efficiency. -iTCTM (Intelligent Throttle Control) system: Operating electronically, this advanced throttle system starts you in neutral for easier dockside starts. It also features activity-specific Touring, Sport and ECO(r) modes that can all be set to accommodate your riding style. The result is a more responsive, more intuitive ride. -iControl(r) Learning Key(r): The programmable Learning Key allows you to limit the performance of the PWC based on rider skill-level. 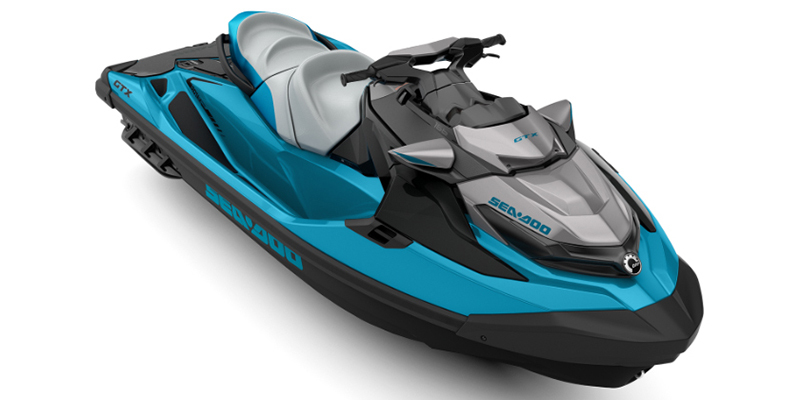 -D-Sea-BelTM system: Combines a series of resonators and vibrationabsorbing components to make Sea-Doo watercraft some of the quietest on the water. -Closed-Loop Cooling System: Uses coolant to keep the engine running at the ideal temperature, much like a car's radiator. Also keeps out corrosive saltwater and debris. -iControl(r): The "Brain" that integrates and controls all systems to create the best possible ride. -ST HullTM: The new benchmark for rough water handling, the fully redesigned ST hullTM is wider, for industryleading stability at both rest and high speeds and expertly tuned to improve offshore performance. -Touring Mode / Sport Mode: Offers a choice between two throttle responses for different riding styles. Touring mode is the default setting offering a more progressive acceleration curve for a more confident ride - ideal for cruising and 2-up riding. Sport mode can be easily activated using the Sport button. It provides full acceleration performance for a more aggressive throttle response. -ECO(r) Mode: This iTCTM function automatically determines the most economical power delivery and sets the optimal RPM for greatest fuel economy. -ErgolockTM Seat with Stepped Design: Seat with narrow profile and knee support that lets riders sit in a more natural position and leverage their leg muscles to hold on to the machine for more control and less upper body fatigue. Also featuring a stepped design for more comfort and better visibility to passengers. -High-Performance VTSTM (Variable Trim System): The VTSTM adjusts the angle of the nozzle to change the behavior of the watercraft and improve parallelism to the water. The high-performance VTSTM provides handlebar-activated quick settings. -RF D.E.S.S.TM Key: With radio frequency technology and a ball-andsocket design, the Digitally Encoded Security System (D.E.S.S.) key provides riders with easy and quick starts every time. Direct Access Front Storage: Gear is now within arm's reach. The industry's first direct-access front storage opens by simply raising the handlebar assembly. No standing required. -Interactive Multifunction Digital Information Center: Cruise control, Slow mode, VTSTM, Fuel level, Tachometer, Speedometer, Hour meter, Compass, Clock, Touring mode, -Sport mode, ECO(r) mode, F-N-R indicator and more. -LinQTM Attachment System: Exclusive quick-attach system on the swim platform allows for easy installation of storage accessories. -iBR(r) (Intelligent Brake & Reverse) system: First and only true brake on a watercraft recognized by the U.S. Coast Guard for improving boating safety since 2009. Now in its -3rd generation, the intuitive and improved iBR(r) allows you to stop close to 160 feet sooner1 for greater peace of mind. All with the squeeze of a lever. And with its electronic reverse, it gives you a level of maneuverability that makes docking easier. -Stainless Steel Impeller: Delivers improved acceleration, higher top speed and less cavitation.